Paleis Het Loo, the Dutch royal hunting lodge and Baroque summer palace famous for its sumptuous interior and formal gardens, is a popular day-trip destination in the Netherlands. Het Loo Palace is a former Dutch royal residence located near Apeldoorn in the province Gelderland in the Netherlands. Originally a hunting lodge and summer residence, the large Baroque palace erected by Stadtholder William and Mary, also later king and queen of England, is now a museum on how the monarchs of the House of Orange lived during the previous three centuries. 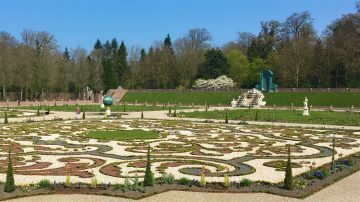 The palace is beautifully furnished but for many the true highlight is the magnificently restored baroque formal gardens that contributed to it sometimes being referred to as the Dutch Palace of Versailles. 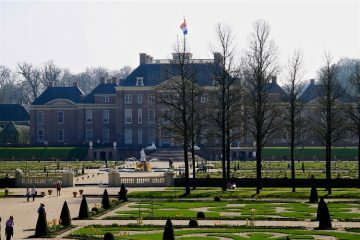 Het Loo Palace is a popular daytrip destination from Amsterdam and Holland. Het Loo became royal Orange property when stadtholder Willem III (1650-1702) acquired a medieval hunting lodge. In 1689, when he, and his wife Mary Stuart, became king and queen of England as well, a prestigious baroque palace with symmetrical formal gardens to rival Versailles were called for and duly constructed. The palace remained a royal summer residence of the House of Orange for the following three centuries and mostly still resembles the original appearance. Queen Wilhelmina used Het Loo as primary residence from her abdication in 1948 until her death in 1962. She vastly expanded the size of the estate before donating it to the Dutch state to preserve it as a park. The last royal residents moved out in 1975. Paleis Het Loo opened as a museum in 1984 while the formal gardens were more recently restored to its former baroque magnificence. Het Loo Palace is a very popular year-round day-trip destination in the Netherlands. The gardens are particularly spectacular during late spring and early summer while Christmas decorations draw visitors during the advent period in December. 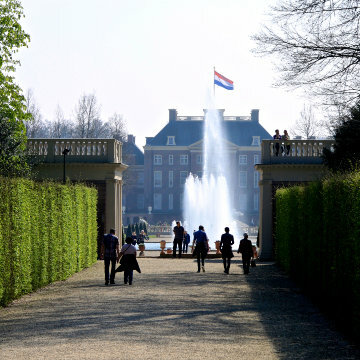 Stables and coach house buildings with admission complex (entreegebouw) – a few minutes walk from the palace. Buy all tickets here! Het Loo Palace – fenced in with the museum and (optional) temporary exhibitions. Baroque formal garden – access through the palace. Entry tickets to Het Loo Palace are sold at the admissions building (entreegebouw / kassa) at the stables (stallen) and coach houses (koetzhuizen) near the parking lot. From here it is a few minutes stroll along a 500-m, tree-lined avenue to the entrance of the main palace. 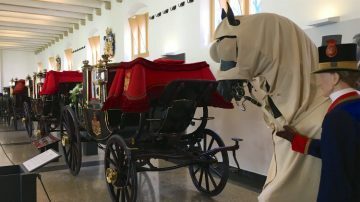 In addition to a self-service restaurant, the buildings on the Stables Square (Stallenplein) still houses a few horses but also a collection of royal carriages and livery. 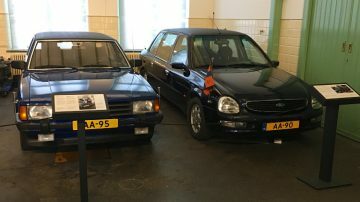 The royal cars give a particularly good indication of the way the Dutch royals behave: the official cars of Queen Beatrix were a state blue stretched Ford Granada (1983-1991) and a Ford Scorpio (1993-1998). Her grandmother Princess Wilhelmina, who had the buildings constructed early in the 20th century, used a more posh 1949 Cadillac Convertible Sedan – the car was recently rediscovered in the USA and returned to Het Loo only a year ago. It has traveled more miles by sea than road! Visitors may see the stables and coach house also after visiting the main palace and gardens. 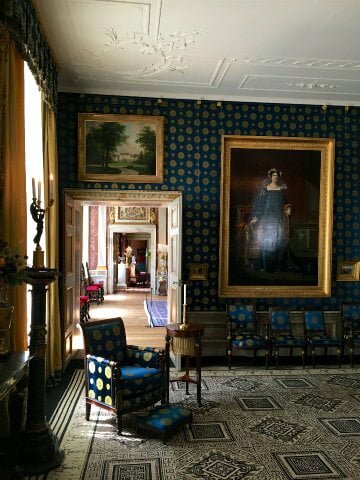 The Museum in Het Loo Palace is spread over around 40 rooms in the baroque palace. 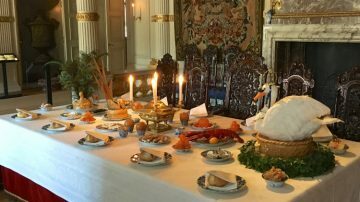 These rooms are furnished and decorated as were typical during the various periods, allowing visitors too see how tastes, furniture, art and customs changed from the late 17th to mid-20th centuries. The palace has a huge collection of paintings of royals spread throughout the palace. 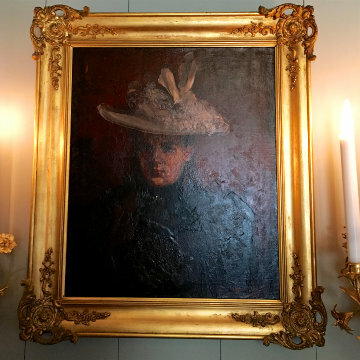 One particularly worth noting from an art history perspective is of Princess Wilhelmina in the Art Cabinet of Willem III – it is a very rare portrait by Piet Mondrian. Some parts of the museum such as the royal kitchens with glass collections and more portraits as well as the museum of chancery of Dutch Orders are only open in the afternoon. Neither is of particular interest to most foreign visitors. Descriptions in the rooms are in Dutch and English with an audio guide available for some of the major items. The audio guide (€3) gives a 90-minute tour through the palace. The temporary exhibitions are on the ground floor of the west wing – to the left once through the main gate near the shop and ballroom restaurant. 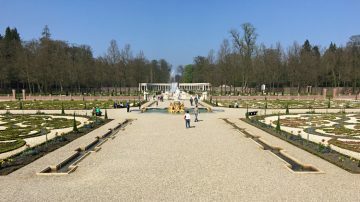 The formal gardens (tuinen) of Het Loo Palace are a major attraction for visitors to the complex. In recent years these gardens were restored as typical Baroque Dutch gardens from the period of William and Mary. Although of course smaller than the gardens and waterworks of Versailles, the King’s Leap (Koningssprong) was at 13 m the highest spouting fountain in Europe at the time. The fountains play from April to October. The most famous tree in the garden is the Canadian maple on the croquet green. Princess Juliana brought maples back from Canada when she returned from exile after the Second World War. Further maple trees are planted elsewhere in the garden. Dakdagen (roof days) on some Wednesdays, Saturdays and Sundays, allow visitors to take a 30-minute guided tour to view the gardens from the roof of the palace (well worth the €1). 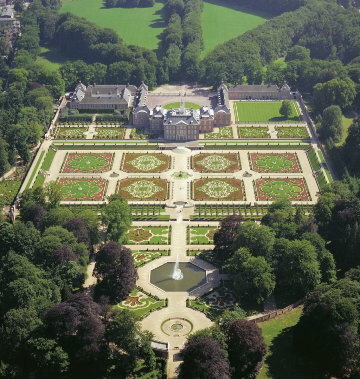 The Palace Park (Paleispark) is a 650 hectare forested park that is part of Het Loo Royal Estate (Kroondomein). Opening times, and details of the parts open to the public at any given time of the year, are posted at the entrances. Visitors are supposed to buy a day ticket (€2) from vending machines near the main entrances. From April to October, visitors to the palace may use for free the entrance at the back of the garden to walk the Orange Trail past a variety of pavilion and kiosks used by the royal family. It is a pleasant walk but of a lower priority. 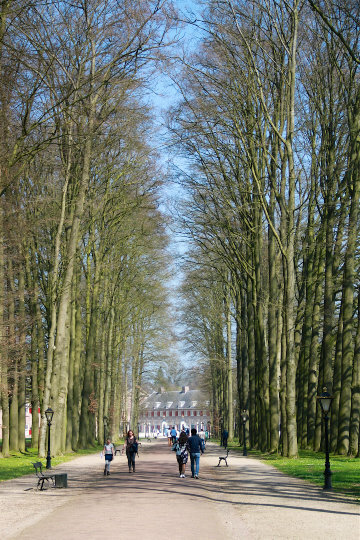 The walk does make clear the meaning of the name Het Loo – it simply means, in archaic Dutch, a clearing in the forest. Veering off the trail, e.g. returning to the parking lot via the rest of the park with maize and a large moated castle, is strictly speaking not included in the palace ticket. This old hunting lodge (Jachtslot) is still used by the royal family and not open to the public. Paleis Het Loo and the baroque gardens are open Tuesday to Sunday from 10:00 to 17:00. The complex is also open on Monday if a public holiday as well as during some school holidays. Het Loo Palace is closed on New Year’s Day but open on other holidays including Christmas. A visit to the palace complex may easily take three hours, or even longer if spending more time in the gardens, having lunch or a picnic in the area. Tickets for Paleis Het Loo give admission to the palace, formal baroque gardens and stable area. Admission to the forest and park surrounding the palace complex is €2 but from April to October may be entered without additional charge from the back of the palace garden. Admission tickets for Het Loo Palace is €14.50 (€5 for children aged 4 to 12). A family ticket is €35 and valid for two adults with up to four children 12 or younger. At Het Loo, tickets are sold only at the admission center (entreegebouw / kassa) at the stables and parking lot, which is a short walk from the palace gates, where tickets are scanned. Tickets purchased online are often a few cents cheaper, skip the line and are valid for use within six months of purchase. The Museumkaart (Dutch Museum Pass) is valid – go directly to the entrance, if not planning on seeing surcharged temporary exhibitions. A surcharge (around €3) is often charged for special temporary exhibitions but is usually optional. Getting to Paleis Het Loo, Amerfoortseweg, Apeldoorn, 7313 AA, is easy by car or public transportation. 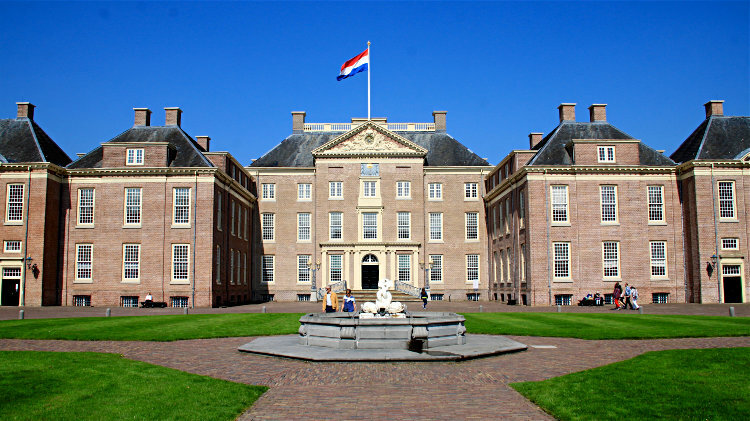 The palace is to the northwest of Apeldoorn – if driving from other parts of the Netherlands, use exit 18 from the A1 or exit 25 from the A50. Parking is €2.50 per hour – maximum €7 per day. 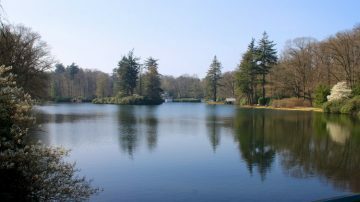 Driving time from Amsterdam to Het Loo Palace is just over an hour and less than half an hour from the Kröller-Müller Museum. Bus 16 (direction Berg & Bos, stop Gedenknaald) and 102 (direction Amersfoort, stop Paleis Het Loo) stop at the entrance building. 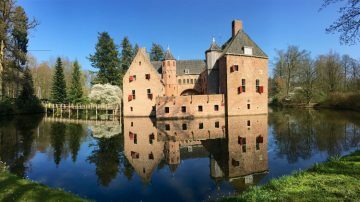 Bus 10 (direction Keschoten, stop Tuinmanslaan) is close to the palace itself but away from the entrance building – useful if bearing a museumkaart or e-ticket and not planning to visit the stables, or to use on the return journey. Traveling time from Amsterdam by trains and bus is around 90 minutes and just over an hour from Arnhem or the Kröller-Müller Museum in the Hoge Veluwe National Park. Het Loo Palace is also sometimes included as a day-trip tour bus excursion from Amsterdam and other cities. Not surprisingly, TripAdvisor users rate Het Loo the number one activity in Apeldoorn. More photos on Flickr.